There is much discussion on whether or not a site created in tables performs worse than a site created in DIVs. I strongly suggest a tableless site as I have seen drastic improvements when I convert a site from tables to DIVs. The main reason a tableless site performs better is because Google does not need to sift through hundreds of nested tables to get to the content. Now this is just one line of code so imagine how much extra code a table site generates once more content is added. Google wants to get straight to your content without sifting through tons of code. The faster the search bot can find your content the better it is for your site. The main navigation menu must be easily found and must be presented in text format. 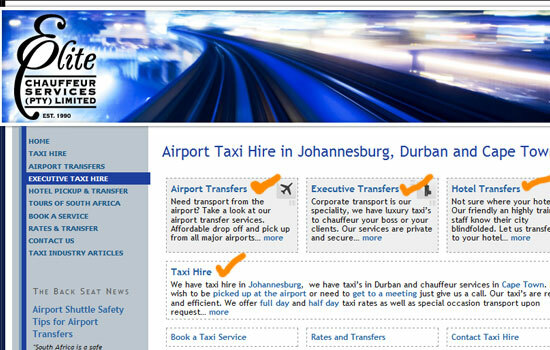 It is a huge misconception that navigation menu’s cannot look great without roll-over images. 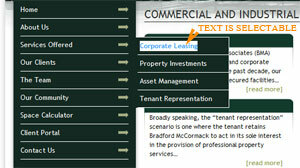 There are many text based menu’s that use jQuery or Mootools that look stunning and are also search engine friendly. NO NOT USE roll-over image based navigation menu’s. To check if your menu is search engine friendly, simply try select the text in the menu. If the text DOES select then your menu is text based and everything is great. If however the text is non-selectable then the menu may be image based in which case you way want to consider upgrading it. If we highlight a page or topic it means that we think it is important. Google wants to know what is important to you. If your products are hard to find for a user then they will be impossible to find for a robot. By highlighting your products you are showing Google what is important to you and Google in return will weigh those key points as “Important Pages”. Many websites make the mistake of rambling on about themselves on their home page. The visitor usually does not care about you, they want to see your products. The same goes for Google, if you talk about yourself then Google will list you well if you search your company name. If you talk about your products/services on the home page then Google will list you for those items and services. People usually do not search for company names but rather search for products and services so best we give the searcher (and Google) what he wants from the start. Remember, Google loves content! therefore, make sure that you always give content preference over images. It is ok to make pretty images, but if the images take up more page space than the text then you will have a problem getting ranked. “Who is going to read all that text?” – Google is! This is why it is good to use excepts. If you give a description on what the linking page contains then you give the user the choice if what he/she wants to read. Search engine optimisation is far more than just playing with some keywords and submitting some thinks. If you build a website with SEO in mind then you are off to a great start. Badly built sites can restrict your site from performing at its optimum level. If you have an existing site that is badly structured and not SEO friendly then it is worth the effort re-structuring the site to make both the visitor happy and the search engines. thanks for a good and informative article. Could you clarify the section “navigation in text”? What do you mean by “selecting” the text; is this while you are designing or when site is live? That would be once the site goes live. If you can select the text then it is text based. If you cannot then it may be an image. Just click the mouse and try drag it across the text.